The first steps to using your theme. On this page we will cover the steps involved with installing the WordPress platform and your Organic Theme. 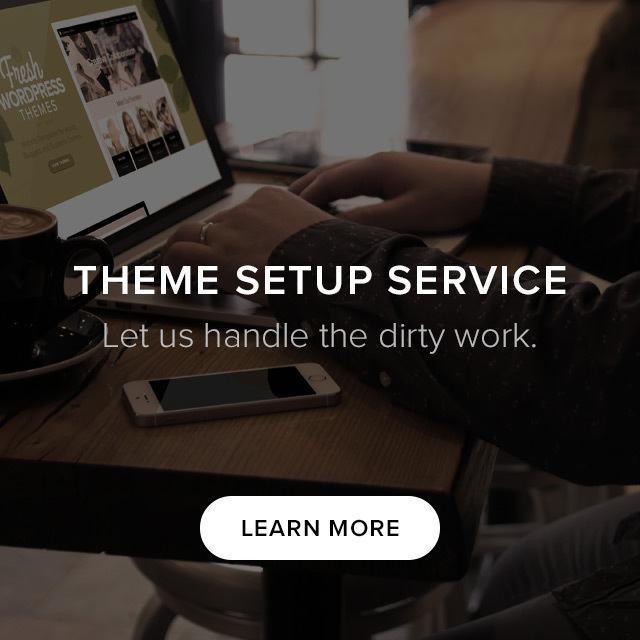 If you are having trouble installing the theme, you may refer to our support or consider our theme setup service. You will need a hosting provider, domain and access to the website’s server in order to install the WordPress platform. Installing the platform on your server can be accomplished by following the instructions here. Navigate to Appearance > Themes within the WordPress admin. Select the “Install Themes” tab at the top. Choose the Upload option near the top. Choose the .zip file of your Organic Theme from your computer and click “Install Now”. Activate the theme after it has uploaded successfully. Configure and save the options within the Appearance > Theme Options section. You’re Done! Begin adding content to the site. For the purists. There’s a little more work involved installing a WordPress theme the traditional way. Download and unzip the theme, if you haven’t already. Next you will need an FTP program such as Transmit or Filezilla. Login to your server using the FTP software. Upload the theme in to the /wp-content/themes/ directory. Navigate to Appearance > Themes and activate the theme.